Are you ready for a frightening opening statement? Running a class for young children (under 6) is probably the most challenging age group to teach! BUT (and it’s a big but) it can also be the most rewarding, and if you get the right balance of structure, imagination and play you’ll get so much enjoyment from teaching this age group you’ll wonder why you never did it before. Read on for some top tips from Twinklesteps teachers on how to run a ballet class for 3-6 year olds that makes your ballet class the highlight of their week. 1) Be Prepared. It’s that old Girl Guide motto but it’s worth its weight in gold. To make the class run smoothly plan your content carefully, remembering that young children can lose focus more quickly. Think about the parts of the class where the children are most likely to get fidgety (e.g. taking turns) and have a few tricks up your sleeve to manage the group. Even if the class isn’t going quite to plan, stay calm and cheerful. A few minor hiccups and mishaps are part of the territory with this age group and, as long as you’re flexible and have Plan B and C at the ready, you can deal with anything! One tip from us is to always have another music play list ready to use that contains lots of moving around to keep the children engaged on a day when they are not so focused. Then if you need to abandon your original plans for the class that day you don’t have to spend time finding music. 2) Make things Fun. You’re working with very young children who love to (and learn through) play. If you can draw on play as their natural learning method you’re working with, rather than against, your class. Incorporate role play, storytelling, sensory experiences and of course participation. At Twinklesteps we’ve found that engaging the children in the story telling, asking them about their ideas and then acting them out in the class really works – at this age they get very excited to share their ideas. When talking about Twinklesteps (the Ballerina Fairy) a little girl in one of our classes said that Twinklesteps lived in her house with her and they practiced their ballet together, but she didn’t like the Goblin and he didn’t come to her house. This then got all the children excited and they wanted to do the exercise where Twinklesteps and the birds were looking for the Goblin. Some of the children wanted to be the Goblin (they love the Goblin music) and the other group wanted to be Twinklesteps. There was a lot of laughter and excitement when they found the Goblins. 3) Use props. Young children can easily lose focus so experimenting with different props can really re-energize them and spark off their imagination. In Twinklesteps’ classes we use lots of props and it really helps to set the mood and atmosphere for each exercise. We use wings and wands, magic sticks (very popular with the boys), scarves, stars and rainbow rings (to go with our rainbow song). Twinklesteps is a real little girl but she’s also a ballerina fairy and has little fairy friends who live in her garden, so we use a little fairy garden, house or door to add to the magic. It also makes a great focus point in the class and the children love to visit Twinklesteps’ garden and to sing and dance to the ‘There are Fairies in my garden’ song. 4) Practice and Repeat. Young children are very capable learners. Don’t be shy of adding in ballet moves with their proper names. We find with the Twinklesteps Syllabus that the children love and learn through repetition and if you repeat the movements lots of times alongside the name of the movement the children quickly learn the names. We also use songs to accompany our syllabus which are simply structured with lots of repetition. They are within the vocal range of young children so they can easily learn to sing and remember them. Children move on from Twinklesteps with a basic foundation in ballet as well as having enormous amounts of fun! 5) Praise and encouragement. Great teachers the world over know that praise works better than criticism. We find that children respond best when they are rewarded for doing something good even if it’s only standing still and getting ready for the next exercise. This has a knock on effect and they all try to get ready first. It also helps to keep control in a nice way and enables you to move on to each exercise more quickly. Children love to please and for the teacher to acknowledge that they have noticed when they are trying hard is very rewarding for them. Teachers everywhere know how giving out stickers works a treat. At Twinklesteps we have our own custom made reward stickers with different little statements on each one – each child has their own sticker card with their name on to keep and get a special reward when they fill the card. 7) Review your Content. If the children aren’t doing what you want them to or are playing up, it’s often because the content is too challenging, not challenging enough, or you’re making demands on them that they’re not up to (e.g. a lot of waiting around with nothing to do, a routine that’s too complicated). It could just be that they’re not in the right mood that week! Be prepared to try altering your content for the following week and don’t forget to be prepared with a backup plan. The Twinklesteps Syllabus deliberately contains a lot of flexibility so you can switch between the more technical exercises or enact scenes out of our story book ‘Twinklesteps and the Disappearing Birdsong’, letting the children choose to be the different characters out of the book. When teaching this age group on some days you have to be prepared to throw out your planned lesson and go with the mood of the children. The next lesson could be completely different and they could be more focused, therefore you can go back to plan A, B or C and do some more technical exercises. If the children are having fun, you will too. 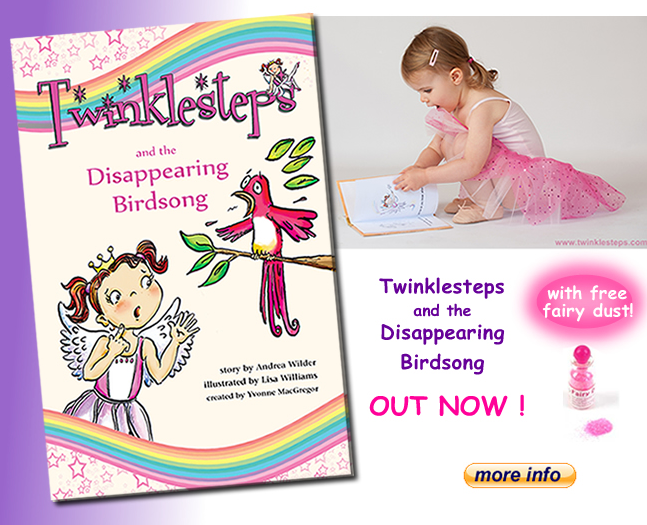 We wrote ‘Dance with Twinklesteps’ with the view to introducing very young children, in a fun and playful way, to the world of dance and in particular- ballet. The syllabus is intended to be entertaining [which we sincerely hope it is!] but also educational as we aim to encourage a love of dance and music in a natural and progressive way through play, story and imagination. We hope you found our tips helpful, these are only some suggestions as we know teachers will have their own way of presenting their class to this age group. Do add your ideas below about what works in your class. If you’re a dance teacher interested in teaching the Twinklesteps Syllabus we’d love to hear from you. Email info@twinklesteps.com to find out more about our ballet programme ‘Dance with Twinklesteps’. Thanks for reading, from The Twinklesteps Team. This entry was posted in Info for Ballet Teachers and tagged ballet, early years, learning, teaching, tips on February 17, 2016 by twinklesteps.